Whether it’s Siri, Google or Alexa, many of us are increasingly using our voices to complete tasks on the go and home. And now, you can use Siri in select Aloft Hotels in Boston and Santa Clara as part of a venture that the hotel chain has with DigitValet called Project Jetson. Control Temperature- All you have to do is ask Siri to adjust the temperature on the thermostat by saying “Hey Siri, cool the room” to your desired temperature. Set the Mood (Music)- To use this feature, guests must be signed into their iTunes account on the iPad. Music plays through the guest’s personal device. All you have to do is ask Siri to play your favorite song, playlist, or radio station! Explore Local Attractions- Need a concierge? Just ask Siri, “what are some attractions near me?” so you can easily navigate and explore your surroundings. 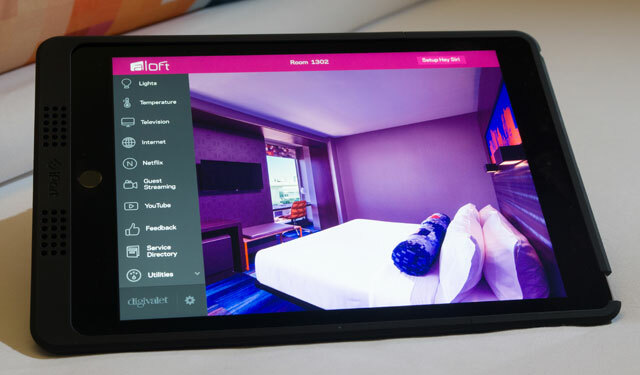 The iPads are loaded with just the Aloft app, which advises guests on how to set up their room the way they like it and how to use their own voice to Siri. Beyond room controls, you can also browser the web, check the weather, access TV listings and more from within the app. After each stay the iPads are reset and all personal preferences are removed from the device to avoid potential privacy issues. But we’d still recommend not signing into your personal accounts on Aloft iPads. Stick with your own devices. If you’re thinking about investing in voice-controlled lighting, music and temperature controls for your home, you may want to check into the Aloft to live with the technology for a night or two.